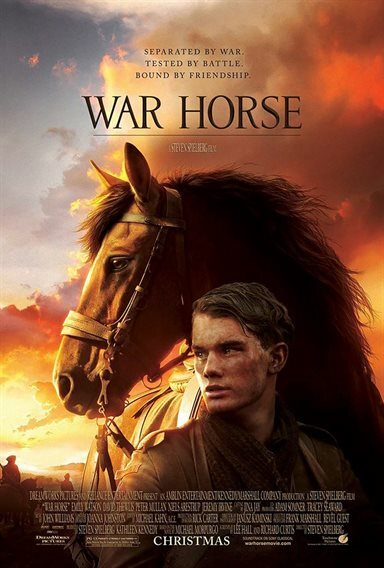 War Horse Is A Well-Made Movie That Shows Courage and Love Between a Boy and His Horse. Steven Spielberg adds another holiday film to the mix, but this one tends to skew higher on the age scale due the violence and cruelty. The film called War Horse has a bountiful cast of good actors, a bold story and brilliant cinematography that sometimes seems ‘too' real. Although targeted to young boys, the film gets a little too strong for immature adolescents. For acting and story however, the movie is a must see. The movie centers on a horse named Joey that gets purchased at an auction by a local English farmer. The man brings it home to work on his fields but quickly finds out that thoroughbreds do not make good plow horses. His son Albert (Jeremy Irvine) bonds with Joey and the horse helps save the farm. War breaks out with Germany and young men are being pressed into service for England. Although Albert wants to join, his age keeps him out of the army, but the much needed horse brigade purchases Joey. So begins the unexpected journey of Joey and the inspiring desire to get back home with his best friend Albert. The amazing photography in War Horse shows the brutality of war and the inhumanity brought about by countries seeking world power. The story puts a beautiful and gallant young horse in harms way leading his master in fights that show the cruelty the animal has to endure. But it's this courage and tenacity by Joey to get back to the boy he loves that makes the film emotional. Direction by Spielberg is evident in the production with strong attention to realism, smooth roll out of story and uplifting ending. His war realism, much like that in Saving Private Ryan, impacts the screen in scenes of violence during a Calvary charge and a run by Joey across ‘No Man's Land' that gets very brutal, deadly and bloody. At one point, although this film takes place in WWI, I thought I was reliving Spielberg's death drive on the beaches of D-Day in Saving Private Ryan with bullets whizzing by, explosions all around and the showings of raw courage by the military. Although the film has been rated PG-13 by the MPAA, please be cautious when deciding to bring pre-teens to a showing. This pertains specially to those youngsters who may become traumatized by the showing of animals lying dead on the battlefield. Download War Horse from the iTunes Store in Digial HD. For more information about War Horse visit the FlickDirect Movie Database.